This is a present and protracted process, and is as yet incomplete. It is the most difficult part of our subject, and upon it the greatest confusion of thought prevails, especially among young Christians. Many there are who, having learned that the Lord Jesus is the Savior of sinners, have jumped to the erroneous conclusion that if they but exercise faith in Him, surrender to His Lordship, commit their souls into His keeping, He will remove their corrupt nature and destroy their evil propensities. But after they have really trusted in Him, they discover that evil is still present with them, that their hearts are still deceitful above all things and desperately wicked, and that no matter how they strive to resist temptation, pray for overcoming grace, and use the means of God’s appointing, they seem to grow worse and worse instead of better, until they seriously doubt if they are saved at all. They are now being saved. Even when a person has been regenerated and justified, the flesh or corrupt nature remains within him and ceaselessly harasses him. Yet this ought not to perplex him. To the saints at Rome Paul said, “Let not sin therefore reign in your mortal body” (Romans 6:12), which would be entirely meaningless had sin been eradicated from them. Writing to the Corinthian saints he said, “Having therefore these promises, dearly beloved, let us cleanse ourselves from all filthiness of the flesh and spirit, perfecting holiness in the fear of God” (2 Corinthians 7:1): obviously such an exhortation is needless if sin has been purged from our beings. “Humble yourselves therefore under the mighty hand of God, that he may exalt you in due time” (I Peter 5:6): what need have Christians for such a word as this, except pride lurks and works within them. But all room for controversy on this point is excluded if we bow to that inspired declaration, “If we say we have no sin we deceive ourselves, and the truth is not in us” (1 John 1:8). The old carnal nature remains in the believer: he is still a sinner, though a saved one. What, then is the young Christian to do? Is he powerless? Must he resort to stoicism, and make up his mind there is naught but a life of defeat before him? Certainly not! The first thing for him to do is to learn the humiliating truth that in himself he is “without strength.” It was here that Israel failed: when Moses made known to them the Law they boastfully declared “all that the Lord has said we will do and be obedient” (Exodus 24:7). Ah! How little did they realize that “in the flesh there dwells no good thing.” It was here, too, that Peter failed: he was self-confident and boasted that “though all men be offended because of Thee, yet will I never be offended…though I should die with Thee, yet will I not deny Thee”—how little he knew his own heart. This complacent spirit lurks within each of us. While we cherish the belief we can “do better next time” it is evident that we still have confidence in our own powers. Not until we heed the Savior’s words “without Me ye can do nothing” do we take the first step toward victory. Only when we are weak (in ourselves) are we strong. The believer still has the carnal nature within him, and he has no strength in himself to check its evil propensities, nor to overcome its sinful solicitation. But the believer in Christ also has another nature within him which is received at the new birth: “that which is born of the Spirit is spirit” (John 3:6). The believer, then, has two natures within him: one which is sinful, the other which is spiritual. These two natures being totally different in character, are antagonistic to each other. To this antagonism or conflict the apostle referred when he said, “The flesh lusts against the Spirit, and the Spirit against the flesh” (Galatians 5:17). Now which of these two natures is to regulate the believer’s life. It is manifest that both cannot, for they are contrary to each other. It is equally evident that the stronger of the two will exert the more controlling power. It is also clear that in the young Christian the carnal nature is the stronger, because he was born with it, and hence it has many years start of the spiritual nature, which he did not receive until he was born again. Further, it is unnecessary to argue at length that the only way by which we can strengthen and develop the new nature, is by feeding it. In every realm growth is dependent upon food, suitable food, daily food. The nourishment which God has provided for our spiritual nature is found in His own Word, for “Man shall not live by bread alone, but by every word that proceeds out of the mouth of God” (Matthew 4:4). It is to this that Peter has reference when he says, “As newborn babes desire the sincere (pure) milk of the Word, that ye may grow thereby” (Peter 2:2). In proportion as we feed upon the heavenly Manna, such will be our spiritual growth. Of course there are other things besides food needful to growth: we must breathe, and in a pure atmosphere. This, translated into spiritual terms, signifies prayer. It is when we approach the throne of grace and meet our Lord face to face that our spiritual lungs are filled with the ozone of Heaven. Exercise is another essential to growth, and this finds its accomplishment in walking with the Lord. If, then we heed these primary laws of spiritual health, the new nature will flourish. But not only must the new nature be fed, it is equally necessary for our spiritual well-being that the old nature should be starved. This is what the apostle had in mind when he said, “Make no provision for the flesh, unto the lusts thereof” (Romans 13:14). To starve the old nature, to make not provision for the flesh, means that we abstain from everything that would stimulate our carnality; that we avoid, as we would a plague, all that is calculated to prove injurious to our spiritual welfare. Not only must we deny ourselves the pleasures of sin, shun such things as the saloon, theatre, dance, card-table, etc., but we must separate ourselves from the worldly companions, cease to read worldly literature, abstain from everything upon which we cannot ask God’s blessing. Our affections are to be set upon things above, and not upon things upon the earth (Colossians 3:2). Does this seem a high standard, and sound impracticable? Holiness in all things is that at which we are to aim, and failure to do so explains the leanness of so many Christians. Let the young believer realize that whatever does not help his spiritual life hinders it. It is true that we are still in this world, but we are not of it (John 17:14). It is true that we are forced to associate with godless people, but this is ordained of God in order that we may “let our light so shine before men that they may see our good works, and glorify our Father which is in heaven” (Matthew 5:16). There is a wide difference between associating with sinners as we go about our daily tasks, and making them our intimate companions and friends. Only as we feed upon the word can we “grow in grace and in the knowledge of our Lord Jesus Christ” (2 Peter 3:18). Only as we starve the old nature can we expect deliverance from its power and pollution. Then let us earnestly heed that exhortation “put ye off concerning the former conversation (behavior) the old man, which is corrupt according to the deceitful lusts, and be renewed in the spirit of your mind, and that ye put on the new man, which, after God, is created in righteousness and true holiness” (Ephesians 4:22-24). Above, we have dealt only with the human side of the problem as to how to obtain deliverance from the dominion of sin. Necessarily there is a Divine side too. It is only by God’s grace that we are enabled to use the means which He has provided us, as it is only by the power of His Spirit who dwells within us that we can truly “lay aside every weight, and the sin which doth so easily beset us” (Hebrews 12:1). These two aspects (the Divine and the human) are brought together in a number of scriptures. We are bidden to “work out our own salvation with fear and trembling” but the apostle immediately added, “for it is God which works in you both to will and to do of His good pleasure” (Philippians 2:12-13). Thus, we are to work out that which God has wrought within us; in other words, if we walk in the Spirit we shall not fulfill the lusts of the flesh (Galatians 5:16). It has now been shown that salvation from the power of sin is a process which goes on throughout the believer’s life. It is to this Solomon referred when he said, “The path of the just is as the shining light, which shines more and more unto the perfect day” (Proverbs 4:18). As our salvation from the pleasure of sin is the consequence of our regeneration, and as salvation from the penalty of sin respects our justification, so salvation from the power of sin has to do with the practical side of our sanctification. The word sanctification signifies “separation”—separation from sin. We need hardly say that the word holiness is strictly synonymous with “sanctification,” being an alternative rendering of the same Greek word. As the practical side of sanctification has to do with our separation from sin, we are told, “Let us cleanse ourselves from all filthiness of the flesh and spirit, perfecting holiness in the fear of God” (2 Corinthians 7:1). That practical sanctification or holiness is a process, a progressive experience, is clear from this: “Follow…holiness without which no man shall see the Lord” (Hebrews 12:14). The fact that we are to “follow” holiness clearly intimates that we have not yet attained unto the Divine standard which God requires of us. This is further seen in the passage just quoted: “perfecting holiness” or completing it. We must now enter into a little fuller detail of the Divine side of our salvation from the power and pollution of sin. When a sinner truly receives Christ as his Lord and Savior, God does not then and there take him to Heaven; on the contrary, he is likely to be left down here many years, and this world is a place of danger for it lies in the wicked one (1 John 5:19) and all pertaining to it is opposed to the Father (1 John :16). Therefore the believer needs salvation from this hostile system. Accordingly we read that Christ “gave himself for our sins, that he might deliver us from this present evil world, according to the will of God and our Father” (Galatians 1:4). Not only is the sinner not taken to Heaven when he first savingly believes; but, as we have seen, the evil nature is not taken out of him; nevertheless God does not leave him completely under its dominion, but graciously delivers him from its regal power. He uses a great variety of means in accomplishing this. [God delivers us from sin’s power] by granting us a clearer view of our inward depravity, so that we are made to abhor ourselves. By nature we are thoroughly in love with ourselves, but as the Divine work of grace is carried forward in our souls we come to loathe ourselves; and that, my reader, is a very distressing experience—one that is conveniently shelved by most of our modern preachers. The concept which many young Christians form from preachers is, that the experience of a genuine believer is a smooth, peaceful, and joyful one; but he soon discovers that this is not verified in his personal history, but rather is it completely falsified. And this staggers him: supposing the preacher to know much more about such matters than himself, he is now filled with disturbing doubts about his very salvation, and the Devil promptly tells him he is only a hypocrite, and never was saved at all. Only those who have actually passed through or are passing through this painful experience have any real conception thereof: there is as much difference between an actual acquaintance with it, and the mere reading of a description of it as there is between personally visiting a country and examining it at first hand, and simply studying a map of it. But how are we to account for one who has been saved from the pleasure and penalty of sin, now being made increasingly conscious not only of its polluting presence but of its tyrannizing power? How explain the fact that the Christian now finds himself growing worse and worse, and the more closely he endeavors to walk with God, the more he finds the flesh bringing forth its horrible works in ways it had not done previously? The answer is, because of increased light from God, by which he now discovers filth of which he was previously unawares: the sun shining into a neglected room does not create the dust and cobwebs, but simply reveals them. Thus it is with the Christian. The more the light of the Spirit is turned upon him inwardly, the more he discovers the horrible plague of his heart (1 Kings 8:38), and the more he realizes what a wretched failure he is. The fact is, dear discovered soul, that the more you are growing out of love with yourself, the more you are being saved from the power of sin. Wherein lies its fearful potency? Why, in its power to deceive us. It lies to us. It did so to Adam and Eve. It gives us false estimates of value so that we mistake the tinsel for real gold. To be saved from the power of sin, is to have our eyes opened so that we see things in God’s light: it is to know the truth about things all around us, and the truth about ourselves. Satan has blinded the minds of them that believe not, but the Holy Spirit hath shined in our hearts “unto the light of the knowledge of the glory of God in the face of Jesus Christ” (2 Corinthians 4:4,6). But further: sin not only deceives, it puffs up, causing its infatuated victims to think highly of themselves. As 1 Timothy 3:6 tells us, to be “lifted up with pride” is to “fall into the condemnation of the devil.” It was insane egotism which caused him to say, “I will ascend into heaven; I will exalt my throne above the stars of God: I will sit upon the mount of the congregation, in the sides of the north. I will ascend above the heights of the clouds: I will be like the Most High” (Isaiah 14:13-14). Is there any wonder, then that those in whom he works are filled with pride and complacency. Sin ever produces self-love and self-righteousness: the most abandoned of characters will tell you, “I know that I am weak, yet I have a good heart.” But when God takes us in hand, it is the very opposite: the working of the Spirit subdues our pride. How? By giving increased discoveries of self and of the exceeding sinfulness of sin, so that each one cries with Job, “Behold! I am vile” (Job 40:4): such a one is being saved from the power of sin—its power to deceive and inflate. This life is a schooling, and chastenings are one of the chief methods God employs in the training of His children. 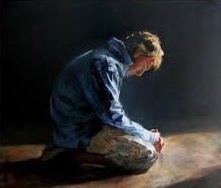 Sometimes they are sent for the correcting of our faults, and therefore we must pray, “Cause me to understand wherein I have erred” (Job 6:24). Let us steadily bear in mind that it is the “rod” and not the sword which is smiting us, held in the hand of our loving Father, not an avenging Judge. Sometimes they are sent for the prevention of sin, as Paul was given a thorn in the flesh “lest he should be exalted above measure, through the abundance of the revelations” given him. Sometimes they are sent for our spiritual education, that by them we may be brought to a deeper experimental acquaintance with God: “It is good for me that I have been afflicted, that I might learn Thy statutes” (Psalms 119:71). Sometimes they are sent for the testing and strengthening of our graces: “We glory in tribulations also: knowing that tribulation works patience; and patience, experience; and experience, hope” (Romans 5:3-4); “count it all joy when ye fall into various trials: knowing this, that the trying of your faith works patience” (James 1:2-3). Chastening is God’s sin-purging medicine, sent to wither our fleshly aspirations, to detach our hearts from carnal objects, to deliver us from our idols, to wean us more thoroughly from the world. God has bidden us, “Be not unequally yoked together with unbelievers…come out from among them, and be ye separate” (2 Corinthians 6:14,17); and we are slow to respond, and therefore does He take measures to drive us out. He has bidden us “love not the world,” and if we disobey we must not be surprised if He causes some of our worldly friends to hate and persecute us. God has bidden us “mortify ye therefore your members which are upon the earth” (Colossians. 3:5); if we refuse to comply with this unpleasant task, then we may expect God Himself to use the pruning-knife upon us. God has bidden us: “Cease ye from man” (Isaiah 2:22), and if we will trust our fellows we are made to suffer for it. “Despise not thou the chastening of the Lord, nor faint when thou art rebuked of him” (Hebrews 12:5). This is a salutary warning. So far from despising it, we should be grateful for the same; grateful that God cares so much and takes such trouble with us, and that His bitter physic produces such healthful effects. “In their affliction they will seek me early” (Hosea 5:15); while everything is running smoothly for us, we are apt to be self-sufficient; but when trouble comes we promptly turn unto the Lord. Own, then, with the Psalmist—“In faithfulness thou hast afflicted me” (Psalm 119:75). Not only do God’s chastisements, when sanctified to us, subdue the workings of pride and wean us more from the world, but they make the Divine promise more precious to the heart: such a one as this takes on a new meaning, “When thou pass through the waters I will be with thee…when thou walk through the fire thou shalt not be burned” (Isaiah 43:2). Moreover, they break down selfishness and make us more sympathetic to our fellow-sufferers: “Who comfortest us in all our tribulation, that we may be able to comfort them which are in any trouble” (2 Corinthians 1:4). By bitter disappointments, God has plainly warned us that “all is vanity and vexation of spirit, and there is no profit under the sun” (Ecclesiastes 2:11), and that by one who was permitted to gratify the physical senses as none other ever has been. Yet we do not take his warning to heart, for we do not really believe it. On the contrary, we persuade ourselves that satisfaction is to be found in things under the sun, that the creature can give contentment to our hearts. As well attempt to fill a circle with a square! The heart was made for God, and He alone can meet its needs. But by nature we are idolaters, putting things into His place. Those things we invest with qualities they possess not, and sooner or later our delusions are rudely exposed to us, and we discover that the images in our minds are only dreams, that our golden idol is but clay after all. God so orders His providences that our earthly nest is destroyed. The winds of adversity compel us to leave the downy bed of carnal ease and luxury. Grievous losses are experienced in some form or other. Trusted friends prove fickle, and in the hour of need they fail us. The family circle which had so long sheltered us and where peace and happiness were found, is broken up by the grim hand of death. Health fails and weary nights are our portion. These trying experiences, these bitter disappointments, are another of the means which our gracious God employs to save us from the pleasure and pollution of sin. By them He discovers to us the vanity and vexation of the creature. By them He weans us more completely from the world. By them He teaches us the objects in which we sought refreshment are but “broken cisterns,” and that we may turn to Christ and draw from Him who is the Well of living water, the One who can alone supply true satisfaction of soul. It is in this way we are experimentally taught to look off from the present to the future, for our rest is not here. “For we are saved by hope but hope that is seen is not hope: for what a man seeth, why does he yet hope for?” (Romans 8:24). Let it be duly noted that this comes immediately after “we ourselves groan within ourselves.” Thus to be “saved by hope” respects our present salvation from the power of sin. Complete salvation is now the Christian’s only in title and expectation. It is not here said that we “shall be saved by hope,” but that we are saved by hope—that hope which looks for the fulfilling of God’s promises. Hope has to do with a future good, with something which as yet “is seen not.” We hope not for something which is already enjoyed. Herein hope differs from faith. Faith, as it is an assent, is in the mind; but hope is seated in the affections, stirred by the desirability of the things promised. And, my reader, the bitter disappointments of life are naught but the dark background upon which hope may shine forth the more brightly. Christ does not immediately take to Heaven the one who puts his trust in Him. No, He keeps him here upon earth for a while to be exercised and tried. While he is awaiting his complete blessedness there is such a difference between him and it, and he encounters many difficulties and trials. Not having yet received his inheritance, there is need and occasion of hope, for only by its exercise can things future be sought after. The stronger our hope, the more earnestly shall we be engaged in the pursuit of it. We have to be weaned from present things in order for the heart to be fixed upon a future good. It is a gift of the Spirit; His operations are within us. God’s great gift of Christ for us is matched by the gift of the Spirit in us, for we owe as much to the One as we do to the Other. The new nature in the Christian is powerless apart from the Spirit’s daily renewing. It is by His gracious operations that we have discovered to us the nature and extent of sin, are made to strive against it, and are brought to grieve over it. It is by the Spirit that faith, hope, and prayer are kept alive within the soul. It is by the Spirit we are moved to use the means of grace which God has appointed for our spiritual preservation and growth. It is by the Spirit that sin is prevented from having complete dominion over us, for as the result of His indwelling in us, there is something else besides sin in the believer’s heart and life, namely, the fruits of holiness and righteousness. To sum up this aspect of our subject. Salvation from the power of indwelling sin is not the taking of the evil nature out of the believer in this life, nor by effecting any improvement in it: “that which is born of the flesh is flesh” (John 3:6) and it remains so, unchanged to the end. Nor is it by the Spirit so subduing indwelling sin that it is rendered less active, for the flesh not merely lusts, but “lusteth [ceaselessly] against the spirit;” it never sleeps, not even when our bodies do, as our dreams evidence. No, and in some form or other, the flesh is constantly producing its evil works. It may not be in external acts, seen by the eyes of our fellows, but certainly so internally, in things seen by God—such as covetousness, discontent, pride, unbelief, self-will toward others, and a hundred other evils. No, none is saved from sinning in this life. Present salvation from the power of sin consists in, first, delivering us from the love of it, which though begun at our regeneration is continued throughout our practical sanctification. Second, from its blinding delusiveness, so that it can no more deceive as it once did. Third, from our excusing it: “that which I do, I allow not” (Romans 7:15). This is one of the surest marks of regeneration. In the fullest sense of the word the believer “allows” it not before he sins, for every real Christian when in his right mind desires to be wholly kept from sinning. He “allows” it not fully when doing it, for in the actual committing thereof there is an inward reserve—the new nature consents not. He “allows” it not afterwards, as Psalm 51 evidences so plainly in the case of David. The force of this word “allow” in Romans 7:15 may be seen from “truly ye bear witness that ye allow the deeds of your fathers; for they killed them (the prophets) and ye build their sepulchers” (Luke 11:48). So far from those Jews being ashamed of their fathers and abhorring their wicked conduct, they erected a monument to their honor. Thus, to “allow” is the opposite of to be ashamed of and sorrow over it: it is to condone and vindicate. Therefore, when it is said that the believer “allows not” the evil of which he is guilty, it means that he seeks not to justify himself or throw the blame on someone else, as both Adam and Eve did. That the Christian allows not sin is evident by his shame over it, his sorrow for it, his confession of it, his loathing himself because of it, his renewed resolution to forsake it. How am I to find salvation? …and how am I to go to that God, on the blood of whose Son I have trampled so long?” I answer, Go to Him in your proper and present character—that of sinner. Go with no lie upon your lips, professing to be what you are not, or to feel what you do not. Tell Him honestly what you are, and what you feel, and what you do not feel. “Take with you words”; but let them be honest words, not the words of hypocrisy and deceit. Tell Him that your sin is piercing you; or tell Him that you have no sense of sin, no repentance, no relish for divine things, no right knowledge of your own worthlessness and guilt. Present yourself before Him just as you are, and not as you wish to be, or think you ought to be, or suppose He desires you to be. Recount your necessities; make mention of the multitude of His mercies; point to the work of the blessed Son; remind Him how entirely righteous it would be for Him to receive and bless you. Appear before Him, taking for granted just that you are what you are, a sinner; and that Christ is what He is, a Savior; deal honestly with God, and be assured that it is most thoroughly impossible that you can miss your errand. “Seek the LORD while He may be found”; and you will see that He is found of you. “Call upon Him while He is near”; and you will find how near He is. But tarry not, for the day is fast closing, and the thick gloom of evening is at hand. The last “woes” are preparing, and the gates of the kingdom shall ere long be shut. The acceptable year of the Lord is running out, and the coming of the Lord draweth nigh. Trifle not with your brief remaining span or inch of hasty time. This earth shall soon shake beneath the footsteps of its coming Judge. Its hills and rocks must soon echo with the sound of the final trumpet. And therefore it concerns men, without delay, to be securing the shelter ere the storm be up. When once the wrath of the Lamb is kindled, who shall escape save those who are sprinkled with His blood? It is an eternal doom that is preparing for the ungodly, and the time that remaineth is short, in which the sinner may escape. He has no moments to fling away, for that which he flings away may be his last. Fool! When wilt thou be wise? Thou art wise for time, and not for eternity. Dost thou not see these thunderclouds? Dost thou not hear the wild tumult of earth, the cry of nations, the shock of falling empires, the crumbling sound throughout the earth that speaks of universal dissolution and ruin? What are these things? The work of chance? A passing earthquake? The burst of frenzy for an hour? No. They are signs of gathering wrath. It is God coming down to smite the guilty earth—that earth upon whose surface you are treading. Written by, William Reid, 1814-1896. It is our belief of God’s testimony concerning His own grace and Christ’s work that brings us into possession of the blessings concerning which that testimony speaks. Our reception of God’s testimony is confidence in God Himself and in Christ Jesus His Son; for where the testimony comes from a person or regards a person, belief of the testimony and confidence in the person are things inseparable. Hence it is that Scripture sometimes speaks of confidence or trust as saving us (see the Psalms everywhere, e.g., Psalms 13:5, 52:8; also 1 Timothy 4:10, Ephesians 1:12), as if it would say to the sinner, “Such is the gracious character of God, that you have only to put your case into His hands—however bad it be—only to trust Him for eternal life, and He will assuredly not put you to shame.” Hence, also, it is that we are said to be saved by the knowledge of God or of Christ; that is, by simply knowing God as He has made Himself known to us (Isaiah 5:3,11; 1 Timothy 2:4; 2 Peter 2:20)—for “this is life eternal, that they might know thee the only true God, and Jesus Christ, whom thou hast sent” (John 17:2). And, as if to make simplicity more simple, the apostle, in speaking of the facts of Christ’s death, burial, and resurrection, says, “By which also ye are saved, if ye keep in memory what I preached unto you” (1 Corinthians 15:1-2). God would have us understand that the way in which we become connected with Christ so as to get eternal life is by “knowing” Him, or “hearing” Him, “trusting” Him. The testimony is inseparably linked to the person testified of; and our connection with the testimony, by belief of it, thus links us to the person. Thus it is that faith forms the bond between us and the Son of God, not because of anything in itself, but solely because it is only through the medium of truth known and believed that the soul can take any hold of God or of Christ. Faith is nothing, save as it lays hold of Christ, and it does so by laying hold of the truth concerning Him. “By grace are ye saved through faith; and that not of yourselves; it is the gift of God” (Ephesians 2:8). 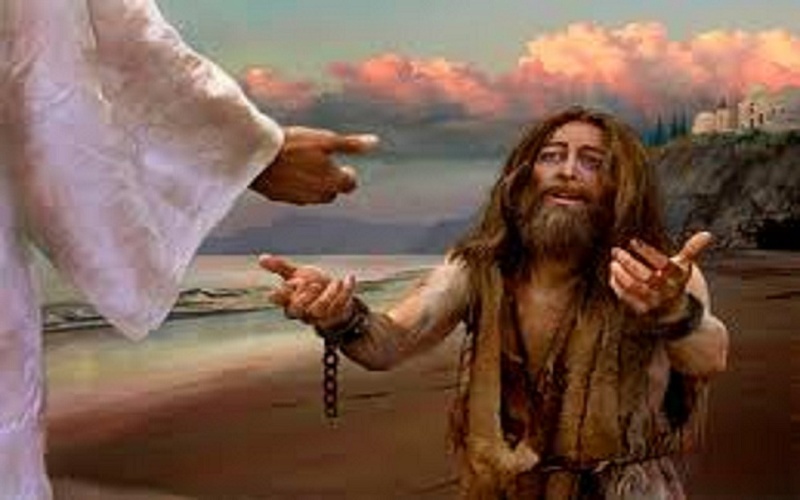 Faith, then, is the link, the one link between the sinner and God’s gift of pardon and life. It is not faith and something else along with it; it is faith alone; faith that takes God at His word, and gives Him credit for speaking the honest truth when making known His message of grace, His “record” of eternal life concerning “the Lamb of God, that taketh away the sin of the world” (John 1:29). “If you object that you cannot believe, then this indicates that you are proceeding quite in a wrong direction. You are still laboring under the idea that this believing is a work to be done by you, and not the acknowledgment of a work done by another. You would willing to do something in order to get peace, and you think that if you could only do this great thing, ‘believing’—if you could but perform this great act called faith—God would at once reward you by giving you peace. Thus faith is reckoned by you to be the price in the sinner’s hand by which he buys peace, and not the mere holding out of the hand to get a peace that has already been bought by another. So long as you are attaching any meritorious importance to faith, however unconsciously, you are moving in a wrong direction—a direction from which no peace can come. “Surely faith is not a work. On the contrary, it is a ceasing from work. It is not a climbing of the mountain, but a ceasing to attempt it, and allowing Christ to carry you up in His own arms. You seem to think that it is your own act of faith that is to save you, and not the object of your faith—without which your own act, however well performed, is nothing. Accordingly, you bethink yourself, and say, ‘What a mighty work is this believing, what an effort does it require on my part, how am I to perform it?’ Herein you sadly err, and your mistake lies chiefly here, in supposing that your peace is to come from the proper performance on your part of an act of faith—whereas it is to come entirely from the proper perception of Him to Whom the Father is pointing your eye, and in regard to Whom He is saying, ‘Behold my servant whom I have chosen, look at Him, forget everything else—everything about yourself, your own faith, your own repentance, your own feelings—and look at Him!’ It is in Him, and not in your poor act of faith, that salvation lies; and out of Him, not out of your own act of faith, is peace to come. “Thus mistaking the meaning of faith, and the way in which faith saves you, gets you into confusion, and makes you mistaken everything else connected with your peace. You mistake the real nature of that very inability to believe of which you complain so sadly. For that inability does not lie, as you fancy it does, in the impossibility of your performing aright this great act of faith, but of ceasing from all such self-righteous attempts to perform any act, or do any work whatsoever, in order to your being saved. So that the real truth is that you have not yet seen such a sufficiency in the one great work of the Son of God upon the cross, as to lead you utterly to discontinue your mistaken and aimless efforts to work out something of your own. As soon as the Holy Spirit shows that you have this entire sufficiency of the great propitiation, you cease at once from these attempts to act or work something of your own, and take, instead of this, what Christ has done. One great part of the Spirit’s work is not to enable the man to do something that will help to save him, but so to detach him from his own performances that he shall be content with the salvation that Christ finished when He died and rose again. “But perhaps you may object further, that you are not satisfied with your faith. No, truly, nor are you ever likely to be. If you wait for this before you take peace, you will wait till life is done. The Bible does not say, ‘Being satisfied about our faith, we have peace with God’; it simply says, ‘Being justified by faith, we have peace with God’ (Rom 5:1). Not satisfaction with your own faith, but satisfaction with Jesus and His work—this is what God presses on you. You say, ‘I am satisfied with Christ.’ Are you? What more then do you wish? Is not satisfaction with Christ enough for you, or for any sinner? Nay, and is not this the truest kind of faith? To be satisfied with Christ, that is faith in Christ. To be satisfied with His blood, that is faith in His blood. What more could you have? Can your faith give you something that Christ cannot? or will Christ give you nothing till you can produce faith of a certain kind and quality, whose excellences will entitle you to blessing? “Do not bewilder yourself. Do not suppose that your faith is a price, a bribe, or a merit. Is not the very essence of real faith just your being satisfied with Christ? Are you really satisfied with Him, and with what He has done? Then do not puzzle yourself about your faith, but go upon your way rejoicing, having thus been brought to be satisfied with Him, Whom to know is peace, life, and salvation. It never deals with sinful self, nor righteous self, in me. It tells me I am ‘born again,’ in CHRIST, my risen Lord. God never intended the Law as an alternate method of salvation, because man’s sinful condition renders the Law “unable” to impart life. The problem lies, not in the Law’s promise of life, but in man’s inability to keep the Law and thus obtain its “righteousness.” For this reason, Paul speaks of “what the Law could not do, weak as it was through the flesh.” Instead of bringing life to fallen men, the Law brings only death: “And I was once alive apart from the Law; but when the commandment came, sin became alive, and I died; and this commandment, which was to result in life, proved to result in death for me.” The commandment did indeed promise life, but it “proved to result” only in death. Paul says that it was “added because of transgressions.” After considering something of what he means by this phrase, we see that God’s ultimate purpose in giving the Law to fallen men was not that they might save themselves by keeping it, but that their utter need of a Savior might be established by their failing to keep it! In light of this truth, several questions immediately press upon each of us, even though we have never lived directly under the Mosaic Covenant. 1. Do I see God’s demands as “holy, righteous, and good” and His requirements as only good and right? 2. Have I stopped blaming God for my sins by excusing them or by imagining that He expects too much of me? 3. Do I realize that I have fallen infinitely short of living a life of perfect love to God and man, and that, in myself, I stand hopelessly condemned in God’s sight? 4. Can I see that I am condemned, not because of any fault on God’s part, but because of my own selfish and wicked heart? 5. Do I realize that I will never be able to establish any righteousness of my own before God or do anything that will obligate Him to love and save me? 6. Have I given up on ever being able to “merit” the merits of Christ? 7. Do I realize that unless salvation is entirely by grace, I will never be saved? If my answer is “yes” to all of these questions, then the law of God has done its intended work in me! I have nothing to do but to look away from myself and put my trust in Christ alone for my righteousness and salvation! “So the ransomed of the LORD will return, and come with joyful shouting to Zion, and everlasting joy will be on their heads.” Hallelujah! “Most wonderful must have been the surprise of the people to hear such proclamation. The ladies running to the windows, the shoemakers throwing their lasts one way and their awls another, running out to meet him and to converse with him, that they might be positive that there was no imposition, and found it to be a fact that could not be contradicted. ‘Oh, the wonder of all wonders! Never was there such a thing,’ must, I think, have been the general conversation. “In a few minutes, however, he arrives at the door of the house, to the great terror and consternation of all the huddled family. He gently tries the door, and finds no admittance. He pauses a moment, steps towards the window, and says in a low, firm, and melodious voice, ‘ My dear wife, if you will let me in, there is no danger, I will not hurt you. I bring you glad tidings of great joy.’ The door is reluctantly opened, as it were between joy and fear. How sweet was all this, the transporting joy of his wife! It is beyond the power of the strongest imagination to conceive the joy and gladness of this family. …and at the same moment the true veil was also rent. It is this that we have now to consider…. For we must take the earthly and the heavenly together, as body and soul. The terrestrial sun and the sun of righteousness must mingle their radiance, and each unfold the other. The waters of the nether and the upper springs must flow together. The Church must be seen in Israel, and Israel in the Church; Christ in the altar, and the altar in Christ; Christ in the lamb, and the lamb in Christ; Christ in the mercy-seat, and the mercy-seat in Christ; Christ in the shekinah-glory, and the shekinah-glory in Him, who is the brightness of Jehovah’s glory. We must not separate the shadow from the substance, the material from the spiritual, the visible form the invisible glory. What God hath joined together, let no man put asunder. 1. It was rent, not consumed by fire. For not its mere removal, still less its entire destruction, was to be signified; but its being transformed from being a barrier into a gate of entrance. Through it the way into the holiest was to pass; the new and living way; over a pavement sprinkled with blood. 2. It was rent while the temple stood. Had the earthquake which rent the rocks and opened graves, struck down the temple or shattered its walls, men might have said that it was this that rent the veil. But now was it made manifest that it was no earthly hand, nor natural convulsion, that was thus throwing open the mercy-seat, and making its long-barred chamber as entirely accessible as the wide court without, which all might enter, and where all might worship. 3. It was rent in twain. It did not fall to pieces, nor was it torn in pieces. The rent was a clean and straight one, made by some invisible hand; and the exact division into two parts might well figure the separation of Christ’s soul and body, while each part remained connected with the temple, as both body and soul remained in union with the Godhead; as well as resemble the throwing open of the great folding door between earth and heaven, and the complete restoration of the fellowship between God and man. 4. It was rent from the top to the bottom. Not from side to side, nor from the bottom to the top: which might have been man’s doing; but from the top to the bottom, showing that the power which rent it was from above, not from beneath; that the rending was not of man but of God. 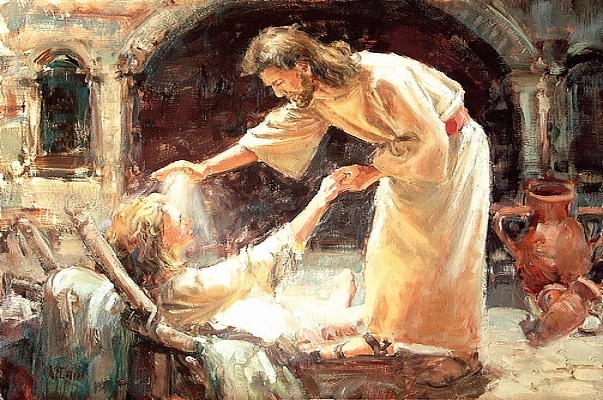 It was man, no doubt, that dealt the blow of death to the Son of God, but, “it pleased the Lord to bruise him; He hath put him to grief.” Beginning with the roof and ending with the floor, the rest was complete; for God, out of His own heaven, had done it. And as from roof to floor there remained not one fragment of the old veil; so from heaven to earth, from the throne of God, down to the dwelling of man, there exists not one remnant nor particle of a barrier between the sinner and God. He who openeth and no man shutteth has, with His own hand, and in His own boundless love, thrown wide open to the chief of sinners, the innermost recesses of His own glorious heaven! Let us go in: let us draw near. 5. It was rent in the presence of the priests. 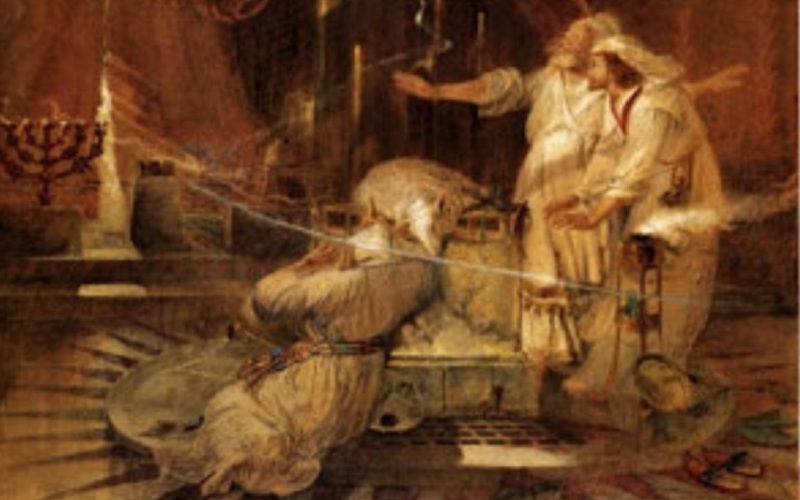 They were in the holy place, outside the veil, of course, officiating, lighting the lamps, or placing incense on the golden altar, or ordering the shewbread on the golden table. They saw the solemn rending of the veil, and were no doubt overwhelmed with amazement; ready to flee out of the place, or to cover their eyes lest they should see the hidden glories of that awful chamber which only one was permitted to behold. “Woe is me, for I am undone; I am a man of unclean lips, and I dwell among a people of unclean lips; for mine eyes have seen the King, the Lord of Hosts” (Isa. 6:5). They were witnesses of what was done. They had not done it themselves; they felt that no mortal hand had done it; and what could they say but that God Himself had thrown open His gates, that they might enter in to precincts from which they had been so long debarred. 6. It was rent that it might disclose the mercy-seat, and the cherubim, and the glory. These were no longer to be hidden, and known only as the mysterious occupants of a chamber from which they might not go out, and into which no man might enter. It was no longer profanity to handle the uncovered vessels of the inner shrine; to gaze upon the golden floor and walls all stained with sacrificial blood; nay, to go up to the mercy-seat and sit down beneath the very shadow of the glory. Formerly it was blasphemy even to speak of entering in; now the invitation seemed all at once to go forth, “Let us come boldly to the throne of grace.” The safest, as well as the most blessed place, is beneath the shadow of the glory. 8. It was rent at the moment when the Son of God died on the cross. His death, then, had done it! Nay, more, that rending and that death were one thing; the one a symbol, the other a reality; but both containing one lesson, that LIFE was the screen which stood between us and God, and death the removal of the screen; that it was His death that made His incarnation available for sinners; that it was from the cross of Golgotha that the cradle of Bethlehem derived all its value and its virtue; that the rock of ages, like the rock of Rephidim, must be smitten before it can become a fountain of living waters. That death was like the touching of the electric wire between Calvary and Moriah, setting loose suddenly the divine power that for a thousand years had been lying in wait to rend the veil and cast down the barrier. It was from the cross that the power emanated which rent the veil. From that place of weakness and shame and agony, came forth the omnipotent command, “Lift up your heads, O ye gates, and be ye lifted up, ye everlasting doors.” The “It is finished” upon Golgotha was the appointed signal, and the instantaneous response was the rending of the veil. Little did the Jew think, when nailing the Son of the carpenter to the tree, that it was these pierced hands that were to rend the veil, and that it was their being thus pierced that fitted them for this mysterious work. Little did he suppose, when erecting a cross for the Nazarene, that cross was to be the lever by which both his temple and city were to be razed to their foundations. Yet so it was. It was the cross of Christ that rent the veil; overthrew the cold statutes of symbolic service; consecrated the new and living way into the holiest; supplanted the ritualistic with the real and the true; and substituted for lifeless performances the living worship of the living God. The broken body and shed blood of the Lord had at length opened the sinner’s way into the holiest. And these were the tokens not merely of grace, but of righteousness. That rending was no act either of mere power or of mere grace. Righteousness had done it. Righteousness had rolled away the stone. Righteousness had burst the gates of brass, and cut in sunder the bars of iron. It was a righteous removal of the barrier; it was a righteous entrance that had been secured for the unrighteous; it was a righteous welcome for the chief of sinners that was now proclaimed. Long had the blood of bulls and goats striven to rend the veil, but in vain. Long had they knocked at the awful gate, demanding entrance for the sinner; long had they striven to quench the flaming sword, and unclasp the fiery belt that girdled paradise; long had they demanded entrance for the sinner, but in vain. But now the better blood has come; it knocks but once, and the gate flies open; it but once touches the sword of fire, and it is quenched. Not a moment is lost. The fulness of the time has come. God delays not, but unbars the door at once. He throws open His mercy-seat to the sinner, and makes haste to receive the banished one; more glad even than the wanderer himself that the distance, and the exclusion, and the terror are at an end for ever. O wondrous power of the cross of Christ! To exalt the low, and to abase the high; to cast down and to build up; to unlink and to link; to save and to destroy; to kill and to make alive; to shut out and to let in; to curse and to bless. O wondrous virtue of the saving cross, which saves in crucifying, and crucifies in saving! For four thousand years has paradise been closed, but Thou hast opened it. For ages and generations the presence of God has been denied to the sinner, but Thou hast given entrance, — and that not timid, and uncertain, and costly, and hazardous; but bold, and blessed, and safe, and free. The veil, then, has been rent in twain from the top to the bottom. The way is open, the blood is sprinkled, the mercy-seat is accessible to all, and the voice of the High Priest, seated on that mercy- seat, summons us to enter, and to enter without fear. Having, then, boldness to enter into the holiest by the blood of Jesus,—by a new and living way which He hath consecrated for us, through the veil, that is to say, His flesh, and having a High Priest over the house of God, let us draw near with a true heart, in the full assurance of faith. The message is, Go in, go in. Let us respond to the message, and at once draw near. To stand afar off, or even upon the threshold, is to deny and dishonour the provision made for our entrance, as well as to incur the awful peril of remaining outside the one place of safety or blessedness. To enter in is our only security and our only joy. But we must go in a spirit and attitude becoming the provision made for us. If that provision has been insufficient, we must come hesitatingly, doubtingly, as men who can only venture on an uncertain hope of being welcomed. If the veil be not wholly rent, if the blood be not thoroughly sprinkled, or be in itself insufficient, if the mercy-seat be not wholly what its name implies,—a seat of mercy, a throne of grace; if the High Priest be not sufficiently compassionate and loving, or if there be not sufficient evidence that these things are so, the sinner may come doubtingly and uncertainly; but if the veil be fully rent, and the blood be of divine value and potency, and the mercy-seat be really the place of grace, and the High Priest full of love to the sinner, then every shadow of a reason for doubt is swept utterly away. Not to come with the boldness is the sin. Not to come in the full assurance of faith is the presumption. 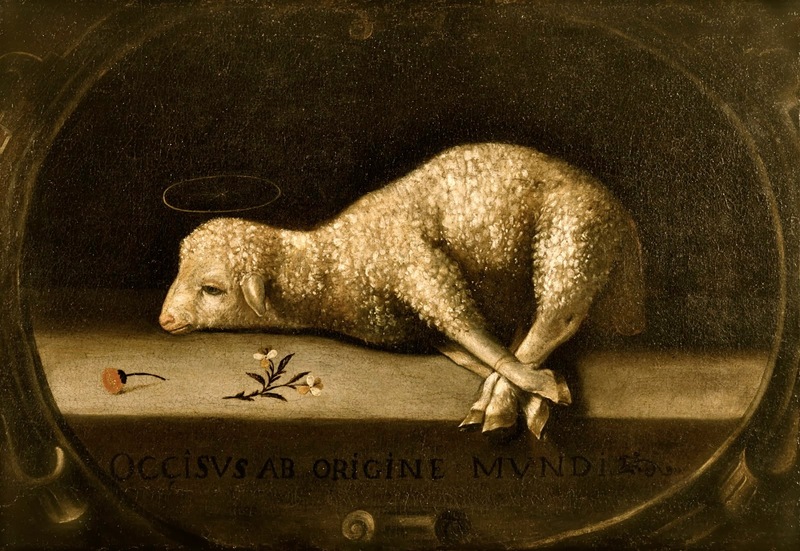 To draw near with an “evil conscience” is to declare our belief that the blood of the Lamb is not of itself enough to give the sinner a good conscience and a fearless access. “May I then draw near as I am, in virtue of the efficacy of the sprinkled blood?” Most certainly. In what other way or character do you propose to come? And may I be bold at once? Most certainly. For if not at once, then when and how? Let boldness come when it may, it will come to you from the sight of the blood upon the floor and mercy-seat, and from nothing else. 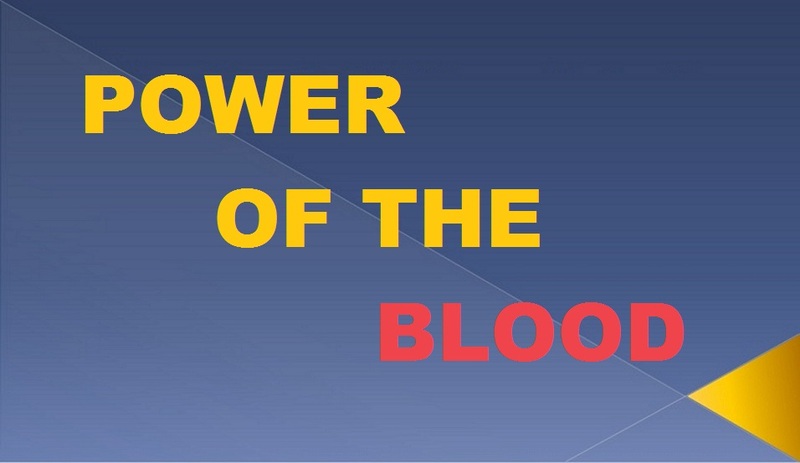 It is bold coming that honours the blood. It is bold coming that glorifies the love of God and the grace of His throne. “Come boldly!” this is the message to the sinner. Come boldly now! Come in the full assurance of faith, not supposing it possible that God who has provided such a mercy-seat can do anything but welcome you; that such a mercy-seat can be anything to you but the place of pardon, or that the gospel out of which every sinner that has believed it has extracted peace, can contain anything but peace to you. The rent veil is liberty of access. Will you linger still? The sprinkled blood is boldness, — boldness for the sinner, for any sinner, for every sinner. Will you still hesitate, tampering and dallying with uncertainty and doubt, and an evil conscience? Oh, take that blood for what it is and gives, and go in. Take that rent veil for what it indicates, and go in. This only will make you a peaceful, happy, holy man. This only will enable you to work for God on earth, unfettered and unburdened; all over joyful, all over loving, and all over free. This will make your religion not that of one who has everything yet to settle between himself and God, and whose labours, and duties, and devotions are all undergone for the purpose of working out that momentous adjustment before life shall close, but the religion of one who, having at the very outset, and simply in believing, settled every question between himself and God over the blood of the Lamb, is serving the blessed One who has loved him and bought him, with all the undivided energy of his liberated and happy soul. To the wandering prodigal, the lover of pleasure, the drinker of earth’s maddening cup, the dreamer of earth’s vain dreams,—they say, there is bread enough in your Father’s house, and love enough in your Father’s heart, and to spare,—return, return. 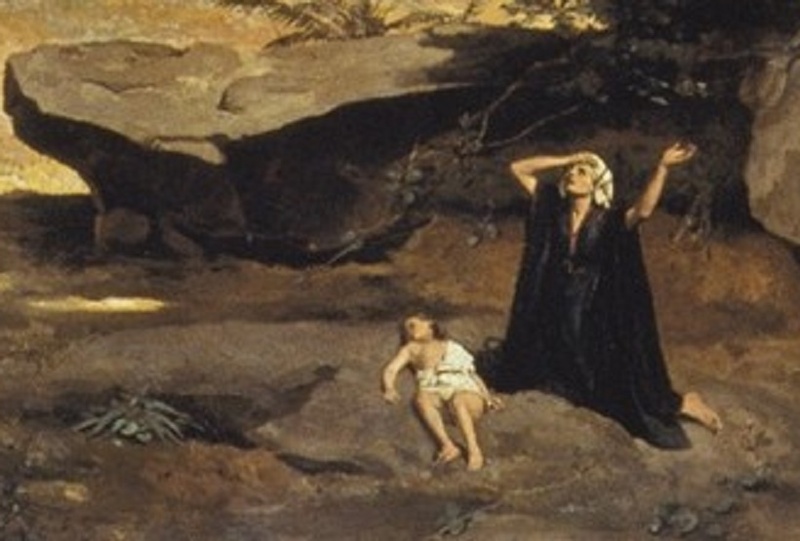 To each banished child of Adam, exiles from the paradise which their first father lost, these symbols, with united voice, proclaim the extinction of the fiery sword, the re-opening of the long-barred gate, with a free and abundant re-entrance, or rather, entrance into a more glorious paradise, a paradise that was never lost. But if all these voices die away unheeded,—if you will not avail yourself, O man, of that rent veil, that open gate,—what remains but the eternal exclusion, the hopeless exile, the outer darkness, where there is the weeping and wailing and gnashing of teeth? Instead of the rent veil, there shall be drawn the dark curtain, never to be removed or rent, which shall shut you out from God, and from paradise, and from the New Jerusalem for ever. Instead of the mercy-seat, there comes the throne of judgment; and instead of the gracious High Priest, there comes the avenging Judge. Yes, the Lord Jesus Christ is coming, and with His awful advent ends all thy hope. He is coming; and He may be nearer than you think. In an hour when you are not aware He will come. When you are saying peace and safety, He will come. When you are dreaming of earth’s long, calm, summer days, He will come. Lose no time. Trifle no more with eternity; it is too long and too great to be trifled with. Make haste! Get these affections disengaged from a present evil world. Get these sins of thine buried in the grave of Christ. Get that soul of thine wrapped up, all over, in the perfection of the perfect One, in the righteousness of the righteous One. Then all is well, all is well. But till then thou hast not so much as one true hope for eternity or for time. It does not meet the necessities of the case to refer to the union between Christ and His people that is effected in their regeneration by the agency of the Holy Spirit and the instrumentality of the faith that is His gift. True, this is indispensable before any can enjoy any of the blessings of His purchase. But there must have been a relation between Christ and His people before He ransomed them. Nor are the necessities of the case met by a reference to the Incarnation. True, the Redeemer must take upon Him flesh and blood before He could redeem, yet there must be a bond of union more intimate than that which Christ holds alike to the saved and the unsaved. He took hold of “the seed of Abraham” (Heb 2:16), not the “seed of Adam”! Nor is it sufficient to say that the relation is that of suretyship and substitution; for the question still calls for answer, “What rendered it fit and righteous that the Son of God should suffer for others, the Holy One be made sin?” It is to this point the inquiry must be narrowed. Christ was the Surety of His people because He was their Substitute. Promoted by infinite love, Christ as the God-man freely accepted the terms of the Everlasting Covenant that had been proposed to Him and voluntarily assumed all the legal responsibilities of His people. As their Head, He came down to this earth, lived, wrought, and died as their vicarious Representative. He obeyed and suffered as their Substitute. By His obedience and sufferings, He discharged all their obligations. His sufferings remitted the penalty of the Law, and His obedience merited infinite blessings for them. Romans 5:12–19 explicitly affirms that the elect of God are legally “made righteous” on precisely the same principle by which they were first “made sinners.” “Our union with Christ is of the same order and involves the same class of effects as our union with Adam. We call it a union both federal and vital. Others may call it what they please, but it will nevertheless remain certain that it is of such a nature as to involve an identity of legal relations and reciprocal 10 obligations and rights.” 11 “For as by one man’s disobedience many were made sinners, so by the obedience of one shall many be made righteous” (Rom 5:19)—“made the righteousness of God in him” (2Co 5:21). The federal relation of Christ to His people was a real one, upon which the infallible God deemed it just to punish Christ for the sins of His people and to credit them with His righteousness, and thus completely satisfy all the demands of His Law upon them. As the result of that union, Christ was in all things “made like unto his brethren” (Heb 2:17), being “numbered (reckoned one) with transgressors” (Isa 53:12). They in turn are “members of His body, of His flesh, and of His bones” (Eph 5:30). In consequence of this federal union, Christ is also made “a quickening 15 Spirit” (1Co 15:45), so that, in due time, each of His people becomes a living and vital member of that spiritual body of which He is the Head (Eph 1:19–23). The relation between Christ and those who benefit from His Atonement was therefore no vague, indefinite, haphazard one, but consisted of an actual covenant oneness, legal identity, and vital union. Suretyship presupposes it. Strict substitution demands it. Real imputation proceeds upon it. The penalty Christ endured could not otherwise have been inflicted. They for whom Satisfaction was made do, by inevitable necessity, share its benefits and receive what was purchased for them. This alone meets the objection of the injustice of the Innocent suffering for the guilty, as it alone explains the transfer of Christ’s sufferings and merits to the redeemed. 1 federal – legal representative. 3 William Greenough Thayer Shedd (1820-1894), Dogmatic Theology, Vol. 2 (New York, NY; Scribner’s Sons, 1891), 361. 4 James Haldane (1768-1851), The Doctrine of the Atonement (William Whyte & Co., 1845). 7 vicarious – suffered by one person as a substitute for another. 8 Hugh Martin (1822-1885), The Atonement: In Its Relations to the Covenant, the Priesthood, the Intercession of Our Lord (London: James Nisbet, 187), 30. 10 reciprocal – given by each of two people to the other. 11 Archibald Alexander Hodge (1823-1886), The Atonement (Philadelphia, Pennsylvania: Presbyterian Board of Publication, 1867), 205. 13 ineffable – incapable of being expressed; indescribable.